Thomas Rintoul did a great job. Was personable and kind. Made the process easy and quick. Much appreciated. Great experience. Justin and Randy were on the ball and got us the car we wanted at a great price. Top shelf service. Actually, this was the best car buying experience ever. Totally confident sales team, gave me the full confidence I needed to make my decision, and get everything together to fit my schedule. Could not have been any better, and...I got a Great Car and a great deal. Thanks, so much. Justin and Richard did a great job helping up! The process was fantastic minus the Capital One financing. We will definitely be back! The process was quick and easy! Thanks to Richard and the team for helping me get my new car! I love it! Justin Wall gave us fast and friendly service. Justin really took good care of us,and provided us with great deal. Very hospitable and accommodating. Visit Avis Car Sale's profile on Pinterest. 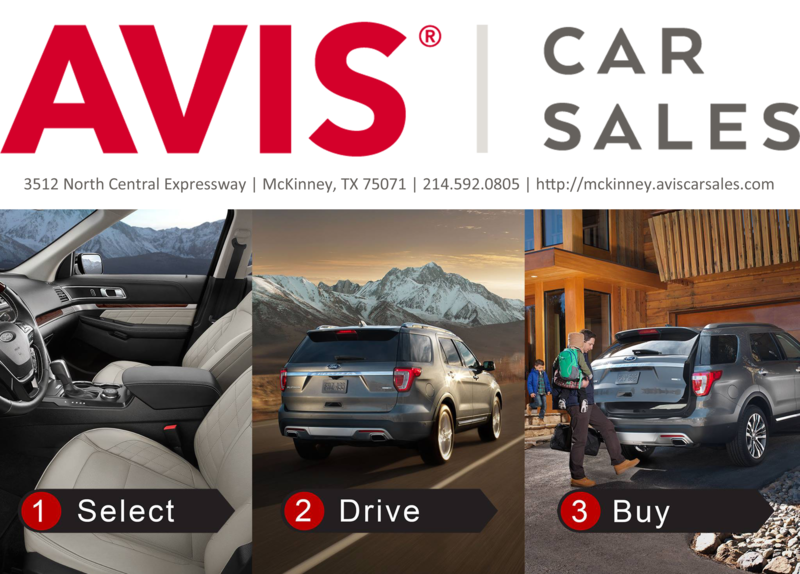 Avis Car Sales in McKinney, TX treats the needs of each individual customer with paramount concern. We know that you have high expectations, and as a car dealer we enjoy the challenge of meeting and exceeding those standards each and every time. Allow us to demonstrate our commitment to excellence! Our experienced sales staff is eager to share its knowledge and enthusiasm with you. We encourage you to browse our online inventory, schedule a test drive and investigate financing options. You can also request more information about a vehicle using our online form or by calling (214) 592-0805.